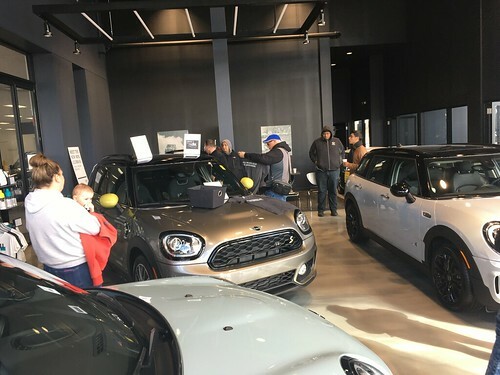 About 20 MINIs braved the cold cold Saturday weather for the drive down to the Auto Show. After fueling up on Donuts and Cupcakes we headed down a salty Sheridan road and Lakeshore drive and eventually made it to McCormick Place. First stop was the MINI exhibit where we had our first chance to be up close and personel with the new 2007 MINI’s. MINIUSA provided a special VIP area on the 2nd floor of the exhibit where we had a chance to have a continental breakfast and drinks. After that, people split up and went to check out lots of cars. Once again the CMMC will be partnering with MINI USA to bring you a unique way to see the Chicago Auto Show. And with the local debut of the next generation Cooper and Cooper S, this year promises to be one to remember. The Chicago MINI Motoring Club has received 16 complementary tickets to the Chicago Auto Show courtesy of Knauz MINI. The first 16 Club members that post a comment to this site can get a free ticket (only one ticket per member please). Plan on meeting us for the Northside drive, or joining us along the route before McCormick place to help us get the ticket to you.